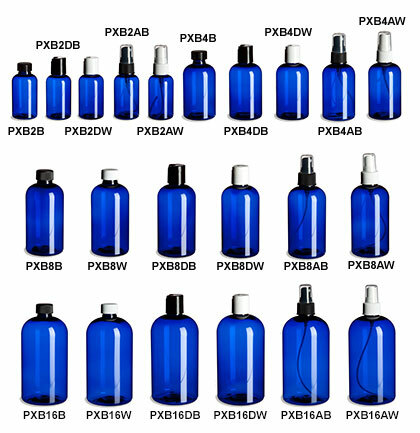 These blue PET bottles are manufacturered in the popular Boston round design, making them a stylish and convenient packaging option. Outfit your entire product line with an array of sizes from 2 ounce to 16 ounce with a variety of dispensing closures. Choose from pumps, atomizers, disc caps, or standard caps. Popular uses include bath and body care, hair care gels and shampoos, or food products. All prices include applicable closure.